Integral Energy is committed to continuous improvement in environmental performance by reducing the impact to land and habitat, air and water in the communities we work in. We strive to not only meet but to exceed regulatory requirements, reflecting our commitment to continuous improvement across all of our operations. Integral conducts its business so as to maximize positive impacts on current and future generations. Our commitment to protecting the environment is an integral part of our operations. We scrutinize our work processes and products to ensure hazardous materials are properly disposed of and materials are recycled whenever possible. During plant upgrades and repairs, we assist clients in disposing of used materials in a safe manner. As part of our daily operations, our environment program focuses on being proactive and we anticipate concerns ahead of time to prevent or mitigate hazards. Through education and training, our employees have a clear understanding of this focus and fully support our commitment to achieving environmental excellence. Integral Energy believes in investing professional expertise, volunteer time and financial resources towards the issues and challenges relevant to the communities in which we live and work. We are proud to be active supporters of the Children’s Wish Foundation of Canada which grants wishes to children diagnosed with a life threatening illness. Over the past few years, Integral Energy has had the privilege and opportunity to fundraise in support of Children’s Wish and help multiple families create lasting memories with their children. As a result of our efforts, Integral was presented with the Treasure Chest Award for raising over $132,000 in the 2014 campaign. This is the largest amount of "treasure" Exile Island has seen raised by a single team in the history of the event. Integral is currently the second largest contributor to the Alberta and Northwest Territories chapter. Integral received two additional awards in 2014: The Children's Wish Foundation Merit Award and the prestigious Rory's Pride Award for outstanding support and raising a cumulative total of over $100,000. These accomplishments are a direct result of the team effort from on-site employees who are eager to participate and rally together to make a huge difference in a child's life. Our fundraising efforts have granted approximately 33 children and their families their wish to ensure every child enjoys an enhanced quality of life including the experience of laughter, shared joy and memories with the important people in their lives. 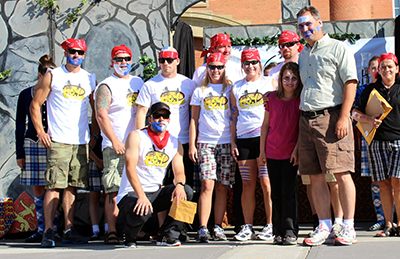 Thank you to everyone that participated in the 2014 “Children’s Wish” Exile Island Fundraiser. Integral employees, subcontractors, vendors, friends and family raised over $132,000 to help our sponsored child and 12 other families realize their wish. The total campaign has raised over $325,000.